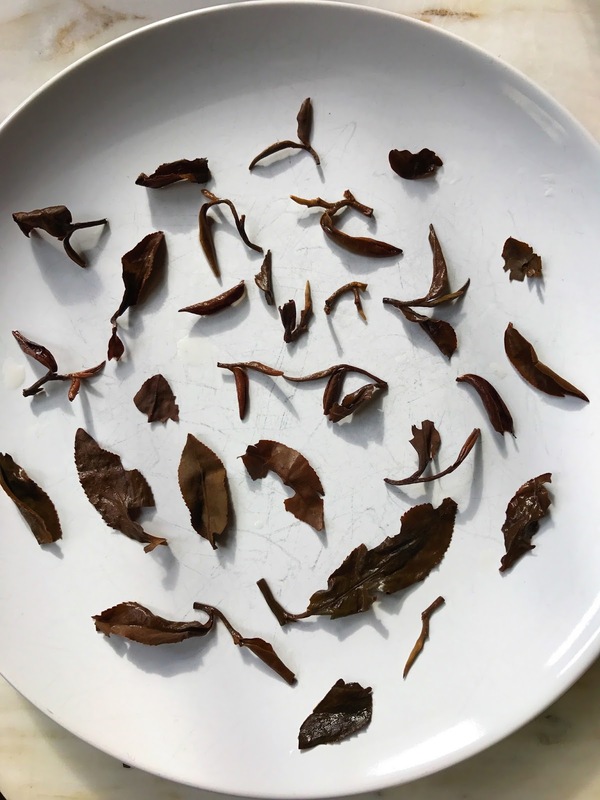 Oriental Beauty is a well known Taiwanese oolong. One of my favorite versions is served iced at Té company. It has a sweet honey-like flavor and the nuances hold up to the icing. Oriental Beauty is highly oxidized which brings out the sweet and fruity notes. The oxidation process actually starts right before it is harvested, when munchy little critters feast on the leaves. I recently received a few teas from Origins Tea, a company that specializes in high quality tea from Taiwan. I'm honestly not sure why I decided to try the Oriental Beauty first, but it is a tea appropriate for the chilly weather. 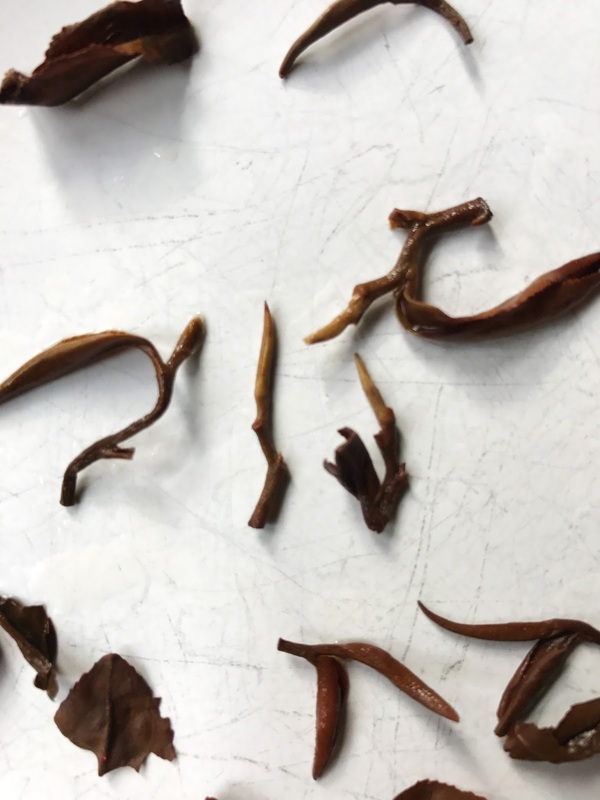 This tea is grown in the Emei township of Hsinchu county, which is in northwestern Taiwan. It was harvested in Summer 2015. The dry leaves are sweet, quite fruity. The fruit reminds me of sticky dried fruits like cherries and apricots. The leaves are a striking mix of colors which you can see above. Note the presence of the fuzzy white buds- this tea is also referred to as bai hao, which I believe translates to 'white tip'. After a quick rinse the leaves exhaled a woodsy aroma with bits of dried twigs and leaves, along with those dried fruits I mentioned earlier. The woodsy notes remind me of kicking through piles of dried fall leaves. I was presented with images of a chilly day fall day and a warming cup of tea. As I mentioned, quite appropriate for the time of year. Although these days we're getting falling snow instead of leaves. The first infusion had a fruity aroma with a soothing flavor. It was super smooth and woody, with that dried fruit (more apricot than cherry this time) and some added honey notes. It made me crave dried apricots for a snack! Serving a bowl of dried fruits and nuts with this tea might be a nice compliment. Subsequent steeps highlighted the honey, and the apricot was still present but more muted. The woodsy flavors hang around as well. I served this tea to our Office Tea Club and everyone enjoyed it. It's a sweet pleasing brew, easy to drink and is quite full-bodied. The flavor lingers on the palate for ages. I love drinking full-bodied teas in the office-when I enjoy the tea then run to a meeting, the flavor stays with me. Comforting me through the fluorescent haze. Thank you to Origins Tea for the sample! We all enjoyed it. Stay tuned for more reviews of their teas. You got some great shots of the leaves! I really love the idea of an office tea club. It's something I definitely should have done when I had a desk job.